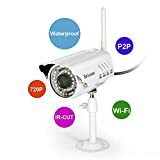 Amazon has the alytimes Sricam metal gun Type waterproof outdoor bullet wifi IP Camera for $53 with free shipping. Sells for $53+ Highest Price. Deals for $53 Lowest Price. Normally $53+. Compatible with b/g/n routers. Requires 2.4GHz band, you must connect your smartphone to the 2.4 Ghz network before syncing to the camera. Note: NO-Support Micro SD storage, video recording Smartphone.